A patio is a Spanish term that means inner courtyard. It is a small paved area outside the house used for the purpose of recreation or dining. It is often decorated with the help of the outdoor furniture and green lush plants. 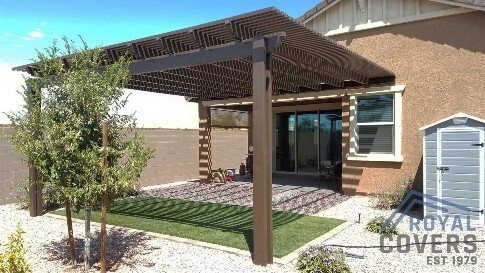 Having a beautiful patio in your house can serve you many purposes just seen at Royal Covers. There are many events that require a space outdoors such as barbecue, birthday party, etc. These events are much more enjoyed when held outdoors in the open air. It also helps the internal of the house in staying clean and tidy. Thus, patio provides a perfect space for carrying out such events. The guests will love the place as well as the weather. You also don’t have to worry about cleaning the mess after the celebration. Thus, the entertainment is doubled. When you have a patio, that implies your backyard will be used more often. So, even in the cold chilly weather, you can utilize your patio to place a hot tub there, enclose it, and incorporate heat to the area. Hence, no matter what weather or season it is, you have a perfect space for the family gathering. All family members can have their private and quality time provided by the space called patio. There is a versatility in size, design, and shape, and therefore patios provide you a chance to design and customize your own private space. You have a free choice of building your patio anywhere you like in order to highlight landscaping, be more private, or making a particular area more reachable. One of the easiest and simplest ways to add more value to your home is adding a patio. A beautiful and impressive patio can add more worth to your home. This is helpful if you plan to sell your house. The prospective buyers will pay you more for the house considering the fact that you have a patio in the backyard of your house. Even the neighbors would want to pay a visit and spend some time with you admiring how you have beautified the house and your patio. It’s quite soothing and peaceful to stare up at the sky full of stars while sitting in your lush green patio. This gives you a quiet time to think and reflect. Also, the plants with which you have made your patio beautiful will provide you with fresh air to breathe. Thus, a good built patio will serve you many purposes that are quite important and significant in your daily life. It will make you love your house more than before, and will get the guests loving it too. There are many ways you can beautify and decorate your patios with the help of different stylish outdoor furniture and eye-catching lush green plants and flowers.